Priyanka Chopra at the Mumbai airport. Actress Priyanka Chopra returned to India and was welcomed by Mumbai rain. Of course, she loved it. The 34-year-old actress arrived in Mumbai on Wednesday night, dressed in a black jumpsuit and a printed jacket. Later, Priyanka instagrammed a picture of herself relaxing at home and wrote as caption: "Rainy Mumbai nights, my favourite. Tujhe chaahoon jaisa hai tu... Teri baarish mein bheegna chaahoon... (sic)" Priyanka really missed home. The Bajirao Mastani actress was in the city in April for a short while before she left to attend a UNICEF charity gala in Zimbabwe and then for the promotion of Baywatch. That's how Priyanka Chopra arrived in Mumbai. Rainy Mumbai nights...... my favourite Tujhe chaahoon jaisa hai tu.. Teri baarish mein bheegna chaahoon.. Posting on Instagram wasn't the only thing Priyanka did last night. She also caught up with what her colleagues were up to on the photo-sharing app. 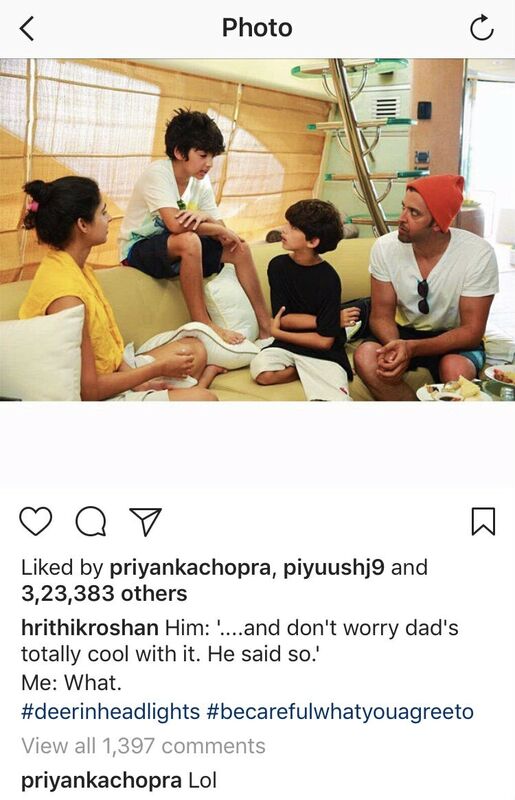 Like here, Priyanka liked and commented on a picture shared by Hrithik Roshan, who was trumped by his sons Hrehaan and Hridhaan. It is a LOL-worthy picture. Priyanka Chopra and Hrithik Roshan co-starred in the Krrish films. Priyanka Chopra was last seen in Hollywood film Baywatch with Dwayne Johnson and Zac Efron. 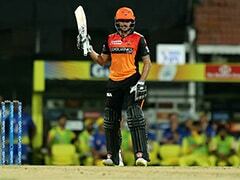 The film didn't earn much worldwide and also failed to impress the Indian audience. Priyanka is now in line to sign two more Hollywood projects, A Kid Like Jake and Isn't It Romantic, reports Variety magazine. She will shoot for the films before she reprises the role of Alex Parrish in the third season of American television show Quantico. Meanwhile, Priyanka Chopra recently made headlines when she met Prime Minister Narendra Modi in Berlin. She was unfairly trolled for wearing a short dress. In a separate Instagram post she shut up the haters like a boss. Last week, Priyanka was told off by Twitter for posting selfies from Berlin's Holocaust Memorial. Priyanka later removed the pictures from her social media account. Complaint In Wayanad Against Rahul Gandhi For Twitter "Campaign"
Inside Nick Jonas And Priyanka Chopra's First Easter As Mr And Mrs. Mama Jonas, Why So Cute?